When you engage in interfaith dialogue, you can end up finding strong similarities between what you and your dialogue partners believe. That’s one of the biggest things Tirzah Maendel and Doris Wurtz learned at the 2017 Canadian School of Peacebuilding (CSOP). 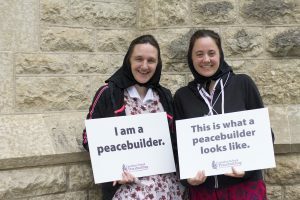 Maendel and Wurtz travelled from their home on the Baker Hutterite Colony, 130 km west of Winnipeg near MacGregor, MB, to take the course Peace Resources in Islam and Christianity. The course was taught by Dr. Mohammad Shomali, founding director of the International Institute for Islamic Studies in Qom, Iran, and Dr. Harry Huebner, Professor Emeritus of Theology and Philosophy at Canadian Mennonite University. The class was made up of students from five different continents, including people from different sects of Islam, different denominations of Christianity and one student with a secular Jewish background. Maendel, a graphic designer who runs a print shop, and Wurtz, a high school teacher, took the course so that they could gain a better understanding of the Islamic faith and Muslim culture. “In the past year, I’ve been involved with two refugee families (from Syria), so I’m hoping to learn how to be a better ally (to) them,” Maendel said. The global rhetoric surrounding Muslim people as well as the current political climate in the United States inspired Wurtz to take the course. Maendel and Wurtz agree that learning about the Islamic faith is fascinating. “(Muslims) see it as a religion of submitting to God’s will, and (I am trying) to bring that idea of submissiveness together with Christian ideas,” Wurtz said. The Christian faith and the Islamic faith might not be so different after all. This was Maendel and Wurtz’s first time at the CSOP, but “probably not the last,” according to Wurtz.